The highly anticipated girl gang entertainer directed by Shashanka Ghosh and starring Kareena Kapoor, Sonam Kapoor, Shikha Talsania and Swara Bhaskar, is all set to hit cinemas worldwide on June 1st 2018. The first look was nothing less than a celebration in itself as audiences saw the leading ladies striking their best poses, looking stunning in sherwanis and donning pagdis. Save the date and #GetReadyForVeereDiWedding on 1st June 2018. Veere Di Wedding is presented by Balaji Motion Pictures in association with Saffron Broadcast & Media, and An Anil Kapoor Film and Communication Network production. 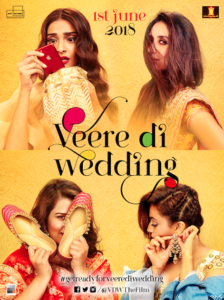 Starring Kareena Kapoor, Sonam Kapoor, Shikha Talsania & Swara Bhaskar and directed by Shashanka Ghosh, Veere Di Wedding releases in cinemas on 1st June 2018.